In keeping with our policy of teaching British Values, we listen to the voice of our children. Our school councillors have been elected by the children. 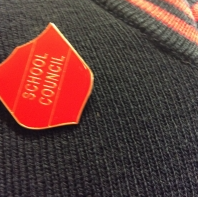 We have a school council which consists of two members from each of the Year 2 classes and two members from the vertically grouped Y1/2 class, who are nominated and voted for. The children have made excellent choices and I know they will do a great job. 1) Help out in our well done assembly. 2) Help the head teacher to decide what to do. 3) Collect suggestions from the class as to improvements to be made in school. 4) Collect any concerns the children have and report them to a teacher. 5) Help out on special days/events. 6) Set an excellent example of behaviour and politeness for the class to follow.